American Press: Athletic Administration by William F. Stier, Jr.
by WILLIAM F. STIER, JR. 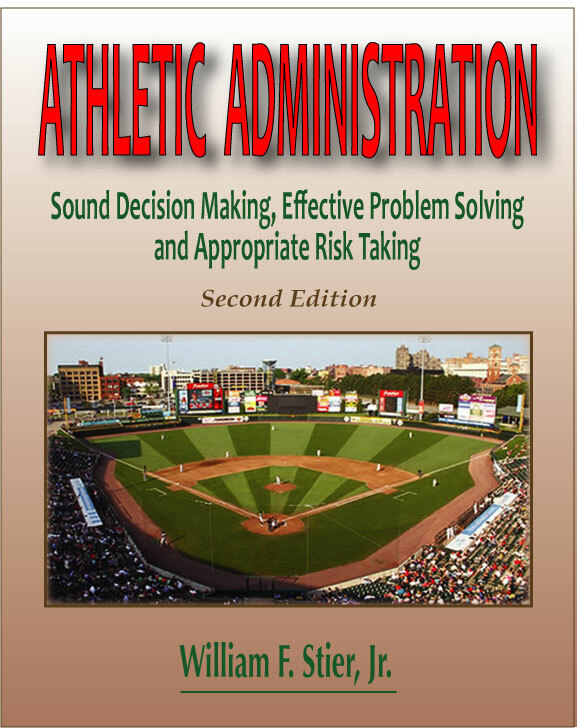 The 2nd edition of Athletic Administration, written by a successful collegiate/university and high school athletic director, is designed to help current and future athletic administrators deal with the myriad of difficulties, challenges and problems that confront them in the performance of their jobs. This is a book about problems and challenges, specifically, how to recognize problems, how to avoid them when possible, and how to resolve them, all within a school-based, competitive athletic setting. It is about having global vision rather than tunnel vision. It is also about athletic administrators surviving problematic and stressful situations. This book was written specifically for use in collegiate courses dealing with the preparation of athletic administrators and sport managers. It is appropriate for future and current athletic directors, as well as other athletic/sport administrators, at all levels of amateur sport competition. The book can also be most helpful when used either as the main text or as an addendum in the “Sport Managaement/Administration” classes since this text deals specifically with teaching would-be athletic managers/sport administrators how to be successful, especially in terms of solving the multitude of problems that face most administrators within the world of amateur, competitive sports.Most of the problem solving principles, strategies and tactics suggested within this book are applicable for all levels of amateur sport competition, i.e., youth sports, junior and senior high school levels, as well as the collegiate or university scene. This book has seven separate but related features that make it somewhat unique in terms of athletic administration and sport management books. Difficulties, challenges and problems in athletics seemingly occur in almost every program, almost on a daily basis. This is unfortunate but it is also reality. These challenges and problems can involve any number of different individuals, constituencies and groups including, but not limited to, coaches, spouses, athletic and central school administrators, athletes, teachers, staff, parents, volunteers, boosters, fans, news media, as well as members of the community (the general public). Successful handling of such difficulties demands not only a significant amount of time and effort on behalf of athletic administrators but also necessitates a great deal of patience and skill as well as appropriate and timely decision making and risk taking.The sample problems and challenges presented within this book are unique and are taken from all aspects of individual and team competitive sports, both on and off the so-called practice and/or playing fields—within a school-based, competitive athletic program. Some problems are associated with actions (or inactions) by individuals. Some problems arise because of contrasting philosophies and priorities of organizations, individuals and/or groups. Some are based on legal problems or interpretations of the law. Other difficulties are team centered. Some are based on controversial issues. And still others emanate from the policies, procedures, practices, priorities and philosophy(ies) of the school and/or athletic department and related entities. If athletic administrators are to enjoy success in their positions of important decision makers and leaders within the world of sport they must be able to appropriately handle a wide variety of problems and challenges, in a timely and appropriate manner, regardless of their source. Problems happen and only the appropriately educated, experienced, competent, professional and skilled athletic administrators are going to find success in their roles as sport managers over the long haul. Current as well as would-be school-based athletic administrators, at all levels, will find the content and organization of this book helpful in their efforts to successfully meet the challenges and resolve many of the problems posed by the ever increasing complexity of amateur athletic competition in this country. The specific benefits that can be derived from reading this book and working through the cases studies are threefold. First of all, readers will be able to develop a better understanding of the principles and concepts behind the processes and tasks associated with problem solving (within the athletic department). Second, readers should be better able to make appropriate and timely decisions in terms of preventing and resolving a wide range of difficulties and challenges associated with the controversial, paradoxical and enigmatic world of school sports, both today and in the future. This is possible through the review of the various case studies. And, finally, readers will also be able to gain valuable experience and practice in establishing various strategic action plans (SAPs), under a variety of different scenarios, by means of working through the unique set of questions that accompany each case study. Since school sports exist now and in the future as wholesome and productive learning environments for youngsters of all ages, it is imperative that there be available competent sport administrators, managers and leaders—skilled and experienced in preventing and resolving problems. Such administrators need to be intimately involved in the planning, implementation, management and evaluation of quality sports programs. Today, problem solving is a necessary part of the repertoire or arsenal of any successful athletic administrator. Helping those given the responsibility for overseeing and managing athletic departments/programs, at all levels of competitive school-based athletic programs, to develop competencies in the art and the science of problem solving, is what this book is all about. Dr. William F. Stier, Jr., a distinguished service professor, is the graduate coordinator of Athletic Administration and directs the coaching certification program and the sports management concentration at the College at Brockport, State University of New York. He has spoken at over 222 international, national, regional and statewide conferences and has authored over 380 scholarly articles in 99 international, national, regional and state scholarly publications. Twenty-eight of Dr. Stier's recent publications include twenty-five books, one CD, a monograph, and a co-edited book. This is his twenty-sixth book! He presently serves as editor of two scholarly, refereed (blind review) professional journals: The Physical Educator and the International Journal of Sport Management. He is also currently listed in Who's Who in International Education and has received numerous honors and awards.